I picked these 8 Awesome Quick-Service Meals not just based on how delicious they all were, but also on the atmosphere and dining experience itself. We’ve stumbled into some pretty cool eateries while using the Quick-Service Dining Plan from Disney on our Disney trips and I’m stoked to share a few of those with you! All of the following Quick-Service Meals listed are available on the Disney Dining Plan under the Quick-Service Meal option. These can all be easily shared by 2 people, as I have most of our trips. Quick-Service Meals include (1) Entrée and (1) Beverage. For more info on Disney’s Dining Plans Click Here. The atmosphere is very quaint in this American Baseball themed Quick-Service Restaurant. We’ve had the MiniCorn Dogs and the Foot-long Hot Dog. With both, we always get the French Fries, but you can get apple slices instead. The fries are shoestring fries and they are the bomb diggity….to be honest, I haven’t had fries at Disney World that weren’t delicious but these are my absolute favorite on property! On our first trip to AristoCrêpes we had the Ham and Cheese Crêpe. Which is loaded with Smoked Ham with Cheese and a Dijon Spread. It was so good! On our Memorial Day trip, we tried the Beef and Cheddar Crêpe. It usually has Beef, Baby Spinach, Sharp Cheddar and Horseradish Cream, but I’m not a fan of horseradish so I got it on the side, and because I loved the Dijon spread from the Ham and Cheese Crêpe so much I got a side of it as well. Super delish! This delectable breakfast platter comes with bacon, sausage, eggs, home-style potatoes, a biscuit and a Mickey Waffle!!! More than enough for two people to share. We’ve had this platter at Disney’s Pop Century Resort, the All-Star Music Resort, and the All-Star Movies Resort and it is my understanding that this platter is served at all of the Disney Resort Quick-Service Restaurants! The Turkey Legs are an absolute must for me on every single Disney Vacation I take. The Turkey Leg pictured above is from the Yak and Yeti in Disney’s Animal Kingdom and is the best on that I’ve had on Disney property! 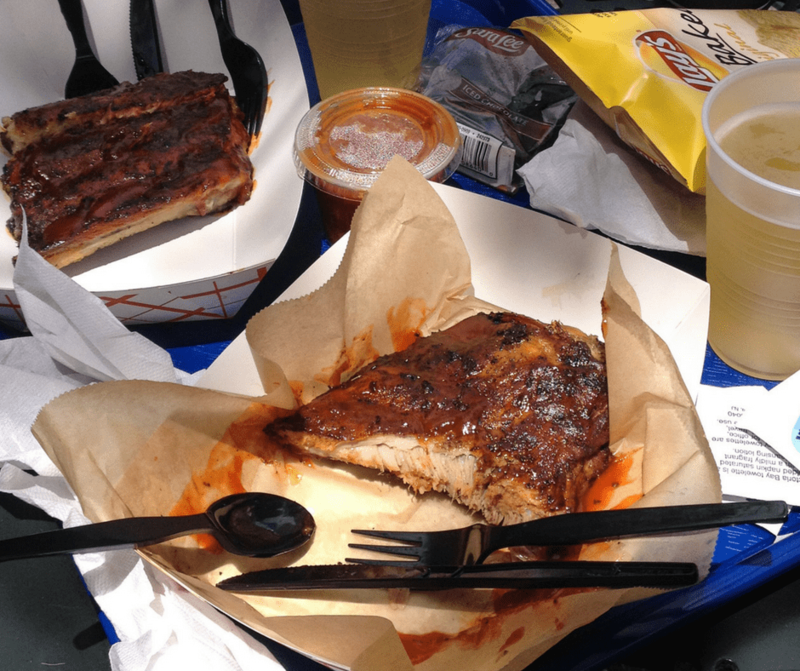 The very first meal we had on our Arrival Day at Disney in April was the Full Rack of Ribs from The Smokehouse at House of Blues in Disney Springs. I can honestly say I’ve been craving them ever since!! We get them almost every time we go! Now I have tried other places but apparently, Disney sprinkled some kind of extra magic on those ribs!!! We’ve had this burger several times now and it is perfection! This perfect burger is called the Southern Burger and it’s a Beef Patty with a Fried Green Tomato, Pimento Cheese, Lettuce, Grilled Onion and Bacon. I have the onion taken off so it really is perfect!! I’m sure some will argue with me on this…onion lovers! Definitely try this Burger and really any burger on Disney property, there are so many to choose from! What’s your favorite burger at Disney World?? Y’all….my mouth is watering just writing about this one!! The Ribs, Chicken, and Pulled Pork Sampler was heavenly. Served with baked beans, coleslaw, and jalapeno cornbread it was more than enough to share. We even put our left-overs in Ziploc bags to bring back to the resort with us. we will definitely be going back on our next trip! So incredible that I had a tie for 1st place….between Lunch and Breakfast!! Step inside the Beast’s Castle, inside Fantasyland at the Magic Kingdom, to find 3 separate rooms to dine in: the Grand Ballroom, the Rose Room, and the West Wing. everywhere should dine here at least once! Try the Grey Stuff for dessert…” it’s delicious…don’t believe me…ask the dishes”!!!! Be Our Guest…Be Our Guest…Put our service to the test!! For our Quick-Service Lunch, I had the Croque Monsieur, which is a Grilled Ham Sandwich with Gruyère Cheese served with Pommes Frites. So good I ate every bite. For our Quick-Service Breakfast this past May(and for my 30th Birthday!!) we had the Croque Madame, which is an Open-Faced Ham Sandwich topped with a Fried Egg, Gruyere Cheese, Béchamel and is served with Fresh Fruit. Absolutely yummy! Breakfast at Be Our Guest also comes with a selection of delicious complimentary pastries such as cinnamon rolls, muffins, and chocolate croissants. Dining here is totally worth it! Be sure to get your reservations 180 days in advance, they go fast. What is one of your favorite Quick-Service Meals at Disney World?? Leave your answer in the comments below!! I love to hear what you guys think!! there are plenty more to come so be sure to Subscribe Below to get all the Vivacious Disney Magic directly to your Inbox!! Want a little extra Disney Magic in your mail?! Subscribe below for Weekly Disney Articles via Email!! I remember that turkey leg well. It’s so good, but so big. You could definitely share it with someone. My mom asked me yesterday what was the first thing I wanted to eat once we went back to WDW in December….I said Turkey Leg!! !